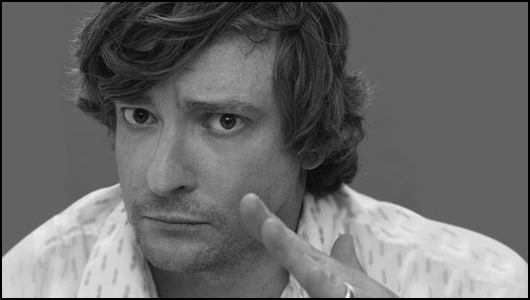 Review: Rhys Darby: This Way To Spaceship – Pleasance Grand, Edinburgh. If you only know Rhys Darby as Murray from Flight of the Conchords, then This Way To Spaceship might surprise you. He’s a far more hyperactive, versatile – and bendy – performer than you might expect. He’s also charismatic, inherently loveable and a better dancer than most professionals, but more on that later. This Way To Spaceship is an energetic and sound-effect packed investigation of how Rhys comes to be on a ship far into deep space after a fictional apocalypse. He’s lost his memory, so he has to recap his life and explore his memories to date to try and figure out what brought him to this point. As structures go, it’s a great hook. Plus, his memories are very entertaining indeed, and interwoven with surreal and creative observational gags about automated bathrooms, Olympic dressage and handshakes amongst many other things. He takes us back to his childhood in New Zealand and days spent hanging out with his school friends (who were dicks, incidentally) while dressed as a ‘time travelling disco soldier’. He also spends quite a lot of time exploring his young adult days. Suffice to say, he was about as good at making small talk at parties as Boris Johnson is at operating a zip wire. At times it’s absolute gold, and he twists and plays with his nostalgic and observational material in clever ways; you’re never quite sure what’s coming next. In fact he’s so skilled I almost want to pull him off stage and march him round to all the other venues, pointing to him and telling other performers: ‘Here, look: this is how you do it’. The final fifteen minutes or so – where he shows off the dance moves that won over his current wife in a Christchurch nightclub – are so funny they’ll probably be etched into my memory for years to come. I certainly want to try and perfect the ‘James Bond Ski-jump’ dance for my own personal use. If the Strictly Come Dancing producers are reading this, you really should give him a call. Darby really is a physical wizard. I really can’t recommend This Way To Spaceship highly enough. It’s a joyful, imaginative show, fizzing with panache and energy: just what the Fringe is all about. Now, if you’ll excuse me I’m off to practice my dance moves to make sure I’m guaranteed a place on a post-apocalyptic intergalactic space flight. Or at the very least, Strictly.